Razor burn is the worst. It’s red, and itchy and just plain old unsightly. Some people are more prone to razor burn than others. If you have thick and curly hair, then you are especially prone. Everything from the type of razor to what products you use decides whether those bumps pop up or not. Here is everything you need to know. Why is exfoliating so important? When you drag your razor across your face, you want the smoothest surface possible. When you have dead skin sitting on the surface of your skin, the razor won’t glide as smoothly making it more likely you will end up with razor burn. After washing your face, apply the facial scrub and gently rub it into your face. When you wash it off, your skin will feel super smooth and ready to shave. If you have thick or curly hair, a trimmer is a must. When you trim your hair down, you are left with these short little stubs that are standing straight up. This is what you want for a perfect shave. Get a trimmer that has an adjustable trim length. Look for a minimum of 1mm. It will become one of your most prized possessions. I’m sure you knew this was coming. 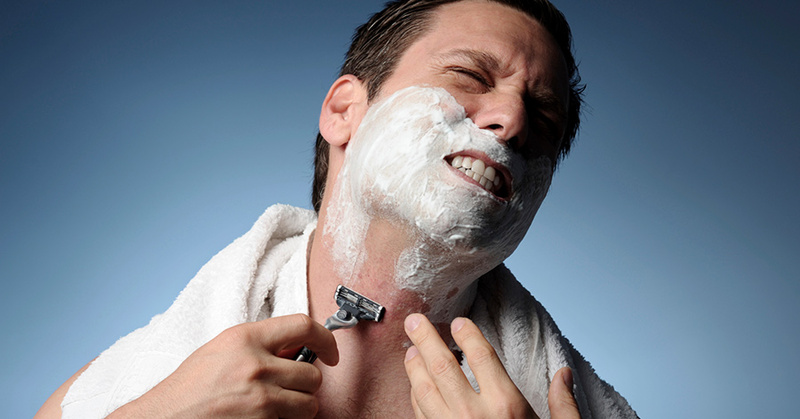 Moisturizing after you shave will change everything. You can buy a facial moisturizer or use an oil like coconut oil or avocado oil. Coconut oil is great because it’s actually antibacterial, so if there is an ingrown hair brewing, the infection will be killed before it even starts. Splashing cold water on your face has the same effect as aftershave, minus the rubbing alcohol which dries out your skin. Cold water shrinks your pores which helps keep bacteria out. Plus it gives you a jolt of energy. You’ll finally understand why Tony Robbins jumps into an ice bath everyday. It kicks you into high gear. If you end up with a red bump, there is a way to get rid of it within hours. The secret is: Uncoated Aspirin. What is the secret ingredient in Aspirin that makes spots disappear? It’s a compound called salicylic acid. You can find uncoated Aspirin at any drugstore. Take about 5 tabs and slowly drop in water until you have a crumbly paste. Apply it to any spots and watch them shrink before your eyes. Don’t go crazy with the six blade razors. These can actually cause bumps because of the way it pulls and thins out the hair follicle. Use a maximum of 3 blades and rinse the razor every time you drag it. There’s a reason why when you get a shave at the barber’s, it feels so smooth and perfect and never a bump in sight. You can have that kind of precision at home if you keep your razor clean.